Self-styled online vigilantes, who attempt to execute social justice for perceived wrongdoing by digging up all they can on perpetrators and spreading the information online, are turning out to be instigators - spurring others to go too far to exact revenge on their targets. The Sunday Times has found that victims - whether mistakenly targeted or not - often suffer depression or anxiety. This comes even as experts warn of real-world ramifications for victims of such online witch-hunts. Some have lost their jobs, received death threats and left the country with their families to escape the relentless persecution. One victim said he has been "punished enough" from having his photos plastered in online posts to being harassed at home. In the latest episode of online vigilantism gone wrong, keyboard warriors took matters into their own hands, but ended up jumping to wrong conclusions. About a week ago, a driver had his name dragged through the mud for reportedly refusing to pay the full cost of petrol wrongly pumped into his BMW at a Caltex petrol pump in Tampines. He claimed to have asked for only $10 worth of petrol, while the pump attendant thought he had wanted a full tank and so pumped $135's worth of fuel. The attendant then told the cashier that he would bear the rest of the bill, according to a Facebook post on the matter. 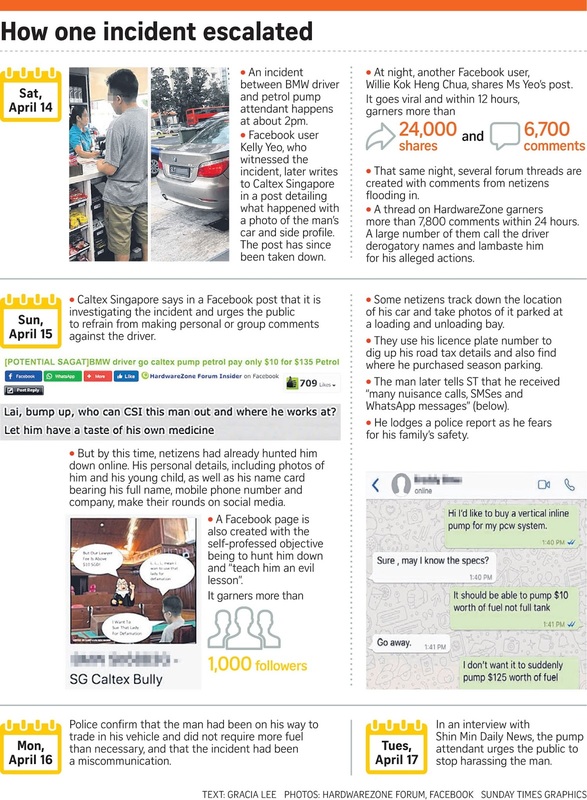 This led Caltex Singapore to assure the public that the attendant "did not bear any financial obligation" for the incident. Even though the case was later established by the police as a misunderstanding, the damage had already been done. Incensed by the driver's actions, online vigilantes trawled through various sites to dig up whatever details they could get on him. These included his mobile number, LinkedIn profile, usual parking spots, road tax details, company he worked at, and even photos of his family. Fearing for his family's safety, the driver - who said he had received "many nuisance calls, SMSes and WhatsApp messages" - lodged a police report. He has since switched off his phone and is on leave from work. This is not the first time an online "investigation" has gone wrong. Last year, student Cherry Tan, 23, found herself at the centre of a furore after netizens wrongly identified her and her boyfriend as being linked to the abuse of an elderly man. This came after a video showed a woman and a man verbally abusing and shoving the old man at a hawker centre in Toa Payoh. Outraged netizens tried to nail down the couple's identity, but ended up haranguing innocent people instead. 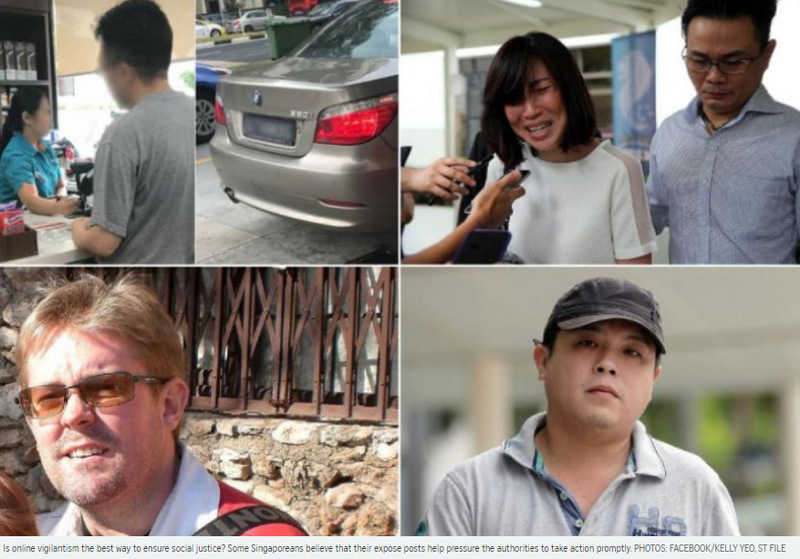 In forums and on Facebook, CSI-ers - a term inspired by the American TV series Crime Scene Investigation - claimed that the couple worked at the United Overseas Bank (UOB), and posted photos allegedly of them. The backlash was so severe that UOB responded the same day the video went viral and denied that the couple were its staff. Ms Tan, who had her photos shared publicly by netizens by then, also clarified that she was not involved in the case. She said it had not only hurt her, but also distressed her family and friends. The real perpetrators, Mr Chow Chuin Yee and Ms Tay Puay Leng, were later fined in court for the use of criminal force and harassment on the old man. But the punishment for them did not end there. Ms Tay reportedly sought psychiatric help after experiencing anxiety being in public. The couple were also intimidated after the case was closed. Once, Mr Chow was in a queue for food when a man stepped on his toes, hoping to pick a fight. Lawyer Lionel Tan, who specialises in social media at law firm Rajah & Tann, said victims of online vigilantism may feel shame or even face difficulties in finding a job. "The damage to the victim's reputation could be significant and may last for a very long time," he added. WHY DO VIGILANTES GET INVOLVED? Such acts of virtual lynching are not new in Singapore. Some individuals named and shamed in recent memory include Mr Jover Chew, the errant Sim Lim Square shop owner who made a Vietnamese customer weep over a case of overcharging for a phone; British expatriate Anton Casey, who lost his job and left the country after receiving death threats for denigrating public transport users here; and former National Trades Union Congress employee Amy Cheong, who was sacked and left Singapore after her online diatribe against Malay weddings held at void decks. It usually begins when a video or a photo of a wrongdoing is circulated. Online sleuths then ferret out personal information such as occupation, identity card number and contact details, often from the person's digital footprint, and publish them on social media such as Facebook, and forums such as HardwareZone. Some may also drag innocent family members into the mess. Motives for such vigilantism can be varied, said observers. They add that some netizens desire to feel the satisfaction of helping a cause, while others just want to show how smart they are. SG Road Vigilante, which advocates road safety, said its intention is to help the police with their work, so that enforcement action is taken against errant motorists. Some online vigilantes believe public support fuels their work. It is similar to a puzzle, where they chalk up as many "juicy details" about the person as possible, says one self-styled vigilante. "We want to help piece together the pieces, to understand the big picture." Some basic tactics include doing a search on social media accounts such as Facebook and Instagram, which may include their contact details, said Mr Bernard Yeo, who used to be a debt collector. "LinkedIn would give you all the employment details," added the 45-year-old, who now works in hospitality. Many also rely on the Accounting and Corporate Regulatory Authority's online services, where they can get details such as the addresses and IC numbers of a company's owners and office holders, he said. In an e-mail reply, the people behind the SMRT Feedback By The Vigilanteh group said the time taken to dig up dirt on wrongdoers ranges from 30 minutes to a week, depending on whether they have known social media accounts and vehicle or flat ownerships, among others. Is online vigilantism the best way to ensure social justice? Some Singaporeans believe that their expose posts help pressure the authorities to take action promptly. Yet, such posts - which do not provide a full picture of what exactly transpired - pushes the public to make assumptions, said observers. Experts said more has to be done as online vigilantism catches on, and the online mob has a disregard for due process of the law and accountability. Singapore Management University law don Eugene Tan said their sense of self-righteousness "is so strong that they operate under their own self-appointed rules". He added that online anonymity emboldens them. "The mistaken sense of anonymity drives some of this behaviour, that they can do what they feel is right without being held accountable." The danger of mis-identification is real. After the Boston Marathon bombing in 2013, for instance, several individuals were wrongly identified on online platform Reddit as suspects. Often, the accused has little opportunity to tell his side of the story. National University of Singapore (NUS) sociologist Tan Ern Ser said the public should not be too quick to judge. "Chances are we would end up whipping out our own pet theories and biases and try to fit the little information, and form a premature, even unfair, judgment on others." Observers also called on netizens to go to the authorities and let them act at their own pace, rather than share the information on social media. The criminal justice system exists so that the public do not feel the need to take the law into their own hands, said NUS law dean Simon Chesterman. "The police have greater powers of search and arrest than the average citizen, but also operate within constraints that are intended to ensure that those powers are used carefully." Professor Chesterman added: "When it comes to public shaming, the centuries-old warning that he or she who is without sin should cast the first stone remains good advice." There is little comfort for victims who are targeted by online vigilantes, it seems. While there are laws in place, enforcing them on keyboard warriors may be an uphill task, observers told The Sunday Times. Lawyers here said there is some recourse for victims, including turning to the Protection from Harassment Act if the vigilantism borders on harassment. Those who are incorrectly identified as wrongdoers by online vigilantes also have grounds to seek recourse for defamation and retraction. Singapore Management University (SMU) law don Eugene Tan said the Act, which can be used against keyboard warriors if their vigilante work manifests itself as threatening behaviour, is probably the best approach, but the challenge is always trying to identify the culprits. Enforcement of the various laws may not be clear-cut. For one thing, "the anonymity of much behaviour online frequently makes prosecution unrealistic", said National University of Singapore law dean Simon Chesterman. It may also be difficult to put up an order against many anonymous individuals under the Act, said Ms Gloria James, head lawyer at Gloria James-Civetta & Co. However, some lawyers believe that there are ways around this. Lawyer Lionel Tan, who specialises in social media at law firm Rajah & Tann, said a possible course of action for victims "is to identify the most egregious online abuser and to file a claim against the abuser for defamation". "This may create a deterrent effect that will discourage further abuse by other netizens." Mr Tan said it is also possible to file legal action and seek the court's assistance to compel the Internet service provider to disclose an anonymous abuser's identity. Observers said that while there are measures in place, the nature of the online realm makes it tough for victims - it's not easy to stop being associated with an incident. Those identified wrongly still turn up in search results on past spats. SMU associate professor Warren Chik said those wrongly accused can request the information to be taken down from Web hosting sites, "but this may not deal with the problem comprehensively as this information can be replicated". Lawyers pointed to making a police report as the best option for now. In response to queries, the police advised victims of online harassment to not respond to harassing SMSes or phone calls, and to lodge a report with them. Mr Satwant Singh of Satwant & Associates said what people post online can return to haunt them. "The Internet can be a bane or a boon, and there is no running away from it," he added. "What is important is that we should not be too quick at the keyboard." For good or for ill, there is, unfortunately, a foolproof recipe for making a post go viral in Singapore. The most recent example of this was an incident between two customers and a pump attendant at a Caltex petrol kiosk on April 14. The first ingredient is having a seemingly entitled antagonist. In this case, it was a man driving an expensive car who apparently made unreasonable demands. The second ingredient is the presence of a "victim". According to the reported sequence of events, the BMW driver claimed to have asked for only $10 worth of petrol. An elderly pump attendant had mistakenly filled up the tank at a cost of $135. The pump attendant, in his 60s, volunteered to personally bear the cost of his mistake. The final element to this heady mix is a third-person account, from someone who claims to have seen what happened, interprets it according to his or her own understanding, and then posts it on social media. In this case, the well-intentioned person related the incident using evocative words. "I am deeply disturbed that the (antagonist) capitalised on the opportunity to make the elderly pump attendant pay for the supposed oversight," she said in a Facebook post. "This lousy person. Driving a big car yet bullies an old man. (He is) rich in the wrong way," she said, adding that the antagonist walked away smugly having paid only $10, and that $125 would count for about 8 per cent of the attendant's monthly salary. The post reached more than 25,000 shares within days, and a witch-hunt began. Based on unverified facts, and without understanding the situation beyond what a stranger related, the court of public opinion condemned the antagonist. What followed is only possible in a highly connected small country. A photograph of the driver, taken from the back, as well as a picture of his car and licence plate number were first shared on social media through Facebook pages such as SG Road Vigilante - a volunteer group of road safety advocates who say they want to promote compliance with traffic rules. Public indignation prompted many self-appointed online guardians of the downtrodden to seek his identity, or "CSI" in net parlance -which stands for the popular crime drama Crime Scene Investigation. The photos were spread on popular forums and, within hours, online sleuths managed to establish the areas in which the car had been sighted. Netizens in those areas contributed by walking around their neighbourhood to look out for it. Photos of the car, complete with location and time stamp, were uploaded routinely. Cyber detectives also managed to uncover the identity of the driver, based on the licence plate and his insurance details. From his name, they tracked down his various online social media accounts. Soon, his face was splashed all over the Internet. Unfortunately, some of these photos included other members of his family. As if that wasn't enough, his name card, which included his mobile phone number and where he worked, was also posted. Even more alarmingly, his home address was uploaded. From there, the harassment began. Jokes and cruel memes aside, there were also real-life consequences. The driver said he received many nuisances calls, SMSes and WhatsApp messages. There were also threats that people would turn up at his house. A police report was filed although no offence was disclosed. Even the elderly pump attendant chimed in. He said the whole incident was a misunderstanding. "I feel that it is not necessary for netizens to be harassing the other party, and it should stop immediately," he said. If the supposed victim in the incident can take a measured stance, the question that inevitably arises is why online sleuths feel the need to get involved. As a social media editor who lives in the thick of the news on a daily basis, it is my job to monitor what happens online. This is not the first time an incident like this has played out, and it certainly won't be the last. To put things in perspective, the Caltex incident involved a misunderstanding which the police investigated and found that no crime had been committed. A cursory check of the past week's news showed that crimes far more dastardly in nature are reported on a daily basis. A man killed his brother-in-law almost 20 years ago and has taken yet another life. A man threatened to kill his own mother. A construction foreman's negligence led to the death of two workers. And yet, none of these cases elicited the amount of online vitriol when compared with the Caltex incident. There is also a matter of groups such as SG Road Vigilante. One of its administrators, Mr Alan Huang, said the group does not encourage users to take matters into their own hands. Administrators of the page said they removed the nastier comments which instigated mob violence. "We just want a safer driving and riding environment for everyone. Our role is to act as a catalyst to push the authorities to take faster action," the 38-year-old added. The problem here is that not everyone is on the same page when it comes to baying for "justice" to be done. While there is nothing wrong with feeling outraged at how a senior pump attendant was treated, the onus is also on many of these online vigilantes to take a step back and decide for themselves if fanning the flames is warranted in the grand scheme of things. And, to trust that the authorities would take the necessary action, if a crime has been committed.